Ex-England youth international Benik Afobe will not play for DR Congo in next weekend's 2017 Africa Cup of Nations clash with Angola. The Bournemouth striker, who has been included in a 27-man final squad, has yet to receive official clearance from Fifa to play for the country of his parents. The 23-year-old has represented England at youth level since 2005, having captained the Under-12s, won the Victory Shield with the U16s, and turned out for the U17s, U19s and U21s. Afobe is expected to join up with his prospective teammates next week in Kinshasa, but Fifa is yet to approve his application to switch nationality under world football's governing body regulations. According to the rules, players who have represented one country at junior level can play for another at senior level if they meet the qualifying stipulations. He holds dual nationality and has not played for England's senior side, making him eligible for the Leopards - once an application has been made to Fifa and approved. 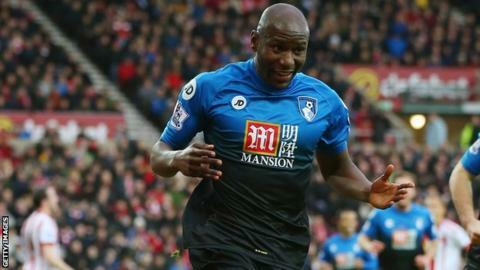 Afobe, who moved to Bournemouth from Wolves for £10m in January, has scored four goals in 10 appearances for the Cherries so far this season. The former Arsenal striker scored 23 goals in two seasons with Wolves. Meanwhile, the DR Congo squad will officially commence their preparations at Béatrice de la Gombe hotel in the capital on 20 March. They are currently third in Group B after a home win over Madagascar and a shock 2-0 defeat at Central African Republic in September. CHAN winner Florent Ibenge, who also guided DR Congo to third place at last year's Africa Cup of Nations in Equatorial Guinea, is desperate for positive results against group leaders Angola. Only group winners are guaranteed automatic qualification to the 2017 tournament in Gabon. The Leopards have also progressed to the final round of qualifying for the 2018 World Cup.